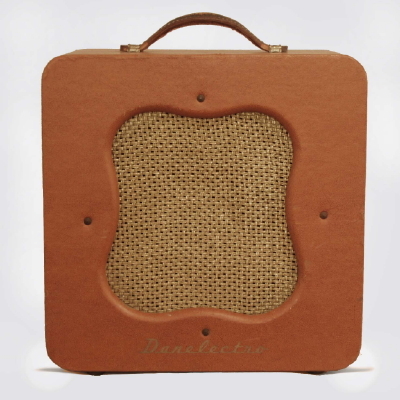 Danelectro Leader Model Tube Amplifier (1953), made in Red Bank, NJ, brown fabric covering finish. A great example of this early Danelectro amplifier, one of Nathan Daniel's first signature creations. Rounded corner, nearly square cabinet with vaguely clover-like speaker hole, covered in what looks very much like the same material as Gibson's 1950's brown cases. Gold Danelectro logo at bottom front. Three inputs and tone and volume controls in rear with brown radio-style knobs. Tubes mount above the chassis and are a nice matched original complement of Sylvania's. The original Rola speaker carries 1953 date code. Very smooth-sounding little amp; not particularly loud, but with a nice round overdriven tone. Height is 16 in. (40.6 cm. ), 16 in. (40.6 cm.) width, and 8 1/4 in. (21 cm.) deep. Completely original including leather handle; an unusually fine specimen! Excellent + Condition.